Mrs. Kilburn Scott’s Samoyedes, at Vale House, Burnt Ash Lane, Bromley, Kent. ALONG the shores of the Arctic Ocean, from the White Sea to the North coast of Siberia, dwell the Samoyede tribe, one of the oldest races in the world. And from that distant land, where the Polar lights play over the frozen wastes and the desolation of the Northern night, came originally the fascinating snow-dogs of to-day. 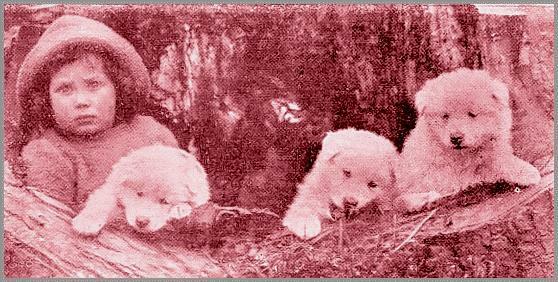 In 1891 a stranger from a far land visited that remote region, and returned home with a specimen of the only valuable possession which the Samoyedes have a puppy of the native canine breed. ”What Yorkshire says to-day, the universe will say to-morrow,” a hundred political platforms tell us at every general election. Yorkshire welcomed Mr. Kilburn Scott's new discovery in dogs — for it was Mr. Kilburn Scott who was the traveller to the Tundras, and it was his puppy which, grown into a dog, came out at Leeds Show in 1892, and was the leader of the now firmly established Samoyede fancy. As well as figuring as the originals of Miss Maud Earle’s famous picture, “ The White Hounds,” the Bromley dogs have enjoyed Royal patronage, and H.M. Queen Alexandra’s Sandringham Pearl, which won at the recent Palace Show, was bred by Mrs. Kilburn Scott, and presented by her to the Queen-Mother. By securing his first puppy, Mr. Kilburn Scott not only brought to our doors the romance of the Arctic and gave us a new and splendid breed, but he has, by his purchase of all the dogs from the Polar expeditions, given Samoyede anciers a personal interest in these adventurous journeys, and what is more important, from a fancy standpoint and that of the welfare of the breed, he has kept up the original stamina and increased the size of the Samoyede as we find it in its own country. Unlike the Eskimo dog, the Samoyede is the most trustworthy of companions, and many a specimen of this breed has left Mrs. Kilburn Scott’s kennels to become the playmate of children; while some have been bought to pass the hours for little sufferers on beds of pain. And has not Pearline, of the Jackson-Harmsworth Expedition, and the beloved of everybody, spent her life since she came to this country in the nursery at Vale House ? And has she not been hugged and pulled about by every child, from the baby upwards? It is well that this trait should be given prominence, as the libel has been circulated that Samoyedes are treacherous. A grossly unfair and unjust charge, because it is glaringly untrue. Another belief held by some people, and one which wants contradicting, is that Samoyedes should have cat-like feet. This dog must have feet that will be useful to it on soft snow as well as on ice and earth, and amongst boulders. As pets and as guards, there is no doubt that the Samoyede reigns supreme. But in being all that it is only fulfilling in this country a part it has played in the life of the Samoyede race for generations — that of friend as well as of servant. But let it not be thought that the Samoyede is not useful, as well as ornamental. The latter quality would receive short shrift in the rigours of its Arctic home. The picture of Mrs. Kilburn Scott’s sledge team which we give here shows the Samoyede at work; and to know that it is a very practical work we need go no farther away than the fact that a team of the Bromley dogs are at present with Captain Scott in his Arctic expedition, and another team has been sent recently to the Jungfrau Railway, with sledge complete, to haul goods and passengers over the glacier there, from the railway to the hotel. The Bromley dogs are now represented in every part of the world. Prince Collonas took two out with him. Some have gone to Patagonia, to the Argentine, to Riga in Russia, to Austria, Germany, Spain, Canada, and, of course, to the United States. It is likely, too, that a team of Samoyedes from Vale House will be one of the competitors in the great Alaskan sledge-dog “ Derby ” next spring. Mrs. Kilburn Scott has been engaged in breeding the Samoyede on scientific lines for twenty years, and during the last decade she has placed over 500 dogs. All the present champion Samoyedes have been bred or are owned by Mrs. Kilburn Scott, and all the silver trophies which have been offered for competition at the leading shows have been held by the Bromley dogs. Although the Samoyede has been used on practically every Antarctic expedition since Major Jackson used them seventeen years ago, the fact that ladies own 90 per cent. of the Samoyede dogs in this country is in itself a suitable answer to the query as to whether the breed is suitable as a house pet. The white colour protects the dogs from the hottest summer sun, and their double coat renders them immune from many of the evil effects of winter weather. Mrs. Kilburn Scott’s kennels are nine minutes’ walk from Grove Park and Sundridge Park stations on the S. E. and C. Railway — twenty-five minutes’ run from London. They are open to inspection at any time, and by calling up telephone number 1239, Bromley, any train can be met. Mr. and Mrs. Kilburn Scott have been the prime movers in the recently formed and immediately successful Ladies’ Samoyede Association, and Mr. Kilburn Scott is the secretary.